Sometimes in your life, you never expected that a negative moment could be a way for a big opportunity that can knock on your door instantly. Like what happened to the Red Lobster waitress who received a check worth $10K. Why? here's how? 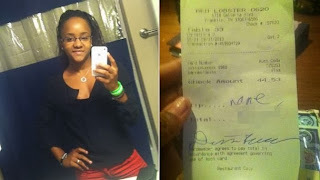 When the time that Toni Christina Jenkins, 19-years old waitress of Red Lobster, saw the receipt on the table, she was shocked because the word 'none' was written on the tip line and the N-word to the total line of the receipt. So what she did was, Jenkins take a photo of it and uploaded to her Facebook account on September 10. In that moment, a man named Matthew Hanson saw the picture and take action on it. Hanson is a founder of AddictingInfo.org, he made an online fund raising campaign titled, "Tips for Toni." He collected more than $10,000 and he gave it to Jenkins on September 30. To make the story short, Toni Christina Jenkins received a whopping $10K tips after posting a receipt with a racist slur. For the meantime, please bookmark this page now or visit this site more often for you to be updated. You may also share this post to your friends so they may know about Red Lobster waitress received a whopping 10 thousand dollar Tip. Comments or suggestions about "Red Lobster waitress received a whopping $10K Tips " is important to us, you may share it by using the comment box below.